One California high school's long avian nightmare is finally over. Rio Americano High School on the east side of Sacramento had been raising money for years to renovate its main athletic field. The project, dubbed "Field of Dreams" by the booster club, funded an all-weather synthetic turf field for football, soccer and lacrosse; a new running track; shot put and discus throwing areas; and sprinting and long-jump alleys. The money also provided for a new snack bar, restrooms, box office and scoreboard. "This is Rio's opportunity to complete the dreams of many," the booster club wrote on its fundraising page. It was set to open April 2 with a boys' lacrosse game, but days earlier construction workers doing a final check of the new turf field found a bird's nest in the end zone. 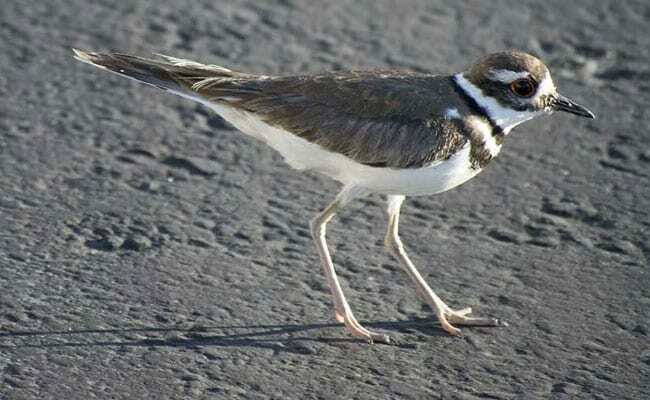 It belonged to a family of killdeer, a roughly pigeon-size bird that likes to nest in open areas such as arid soil, gravel, grassland or, in this case, artificial turf. Even though the birds are not endangered - in fact, they're very common - they are protected by the Migratory Bird Treaty Act of 1918, which makes it illegal to possess, sell or disturb any bird that migrates between the United States and Canada without a federal waiver. So when the nest was discovered on Rio Americano's new field, Principal Brian Ginter said the grand opening would have to wait. Construction crews erected a barrier around the it so as not to disturb the birds or the four eggs inside. The lacrosse team would just have to wait for them to hatch. "The bird showed up, and we'll just let it do its thing and then we'll use the field when we can," Ginter told the Sacramento Bee. So the team, and community, waited. And waited. It takes 24 to 28 days for killdeer eggs to hatch, according to the National Audubon Society. Once they do, the family unit (both killdeer parents care for young) don't maintain a nest and the field would be available for play. "We've had parents inquire with us because they're very anxious, they want to get on the field," Ginter said. "But basically with when the bird came and what the incubation period is its only a few more days' wait, so we're just teaching students to be patient, and then we'll use the field when we can." Finally last Wednesday, the eggs hatched. Rio Americano's spring teams will get to play their first games in the new stadium next week, when the school returns from spring break, Ginter wrote in an email to The Washington Post. Until then, the killdeer family still has the run of the roost, but thanks to their migratory patterns, they likely won't be around when students return to campus. A Teen Helped Police Find His Missing Friend's Body. Detectives Now Suspect He's The Killer.